On Tuesday, April 25, aviation students from Purdue University visited Envoy Headquarters for a special behind-the-scenes tour of our operation, guided by Purdue Alum and Envoy Captain Andrew Benich, as well as Envoy Captain Taylor Hinckley. 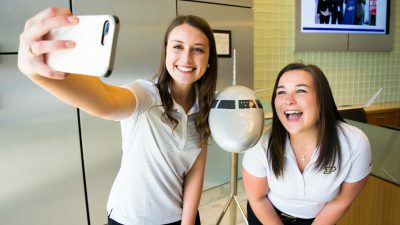 A special Envoy charter flight brought Purdue students and faculty from Lafayette (LAF) to Dallas/Fort Worth (DFW), where the group received a tour of Envoy Headquarters, the American Airlines Training Center and C.R. Smith Museum. During their visit, students had the chance to meet and speak with AA Flight Simulator Instructor, Craig Ritchie, who encouraged students to take advantage of Envoy’s Cadet Program, not just for the financial benefit, but for the opportunity to learn more about themselves and others. Students gained valuable career advice and learned what it takes to run a 24-hour operation, all before heading back to school. Thanks to all the students who signed up to join us – We hope you’ll come back for another visit in the future! Click here to view more photos of the student’s visit.